AL FARIS support delivery of the Route 2020 Project – the metro extension for Expo 2020 Dubai site. 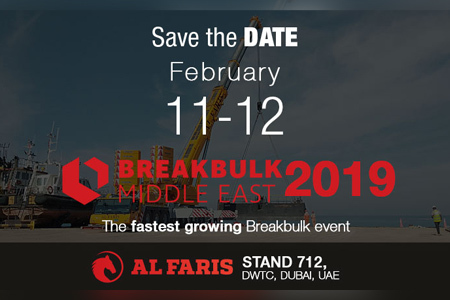 Having previously worked on the Dubai Metro Lines, Al Faris was awarded the job of loading, transporting and lifting the heaviest precast Girders of the Route 2020 which is often referred to as the “Journey into the Future” after Dubai’s award of the Expo 2020. ‘A project of this nature with multiple jobs requires detailed planning and optimized utilization of equipment for a successful execution which is all done in-house by our competent engineers and technicians’ says Kieve Pinto, Al Faris Executive Director. 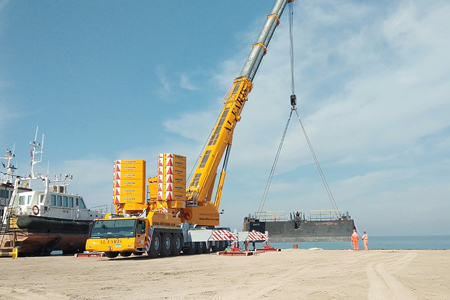 After careful calculations and analysis, it was decided to use a Gantry System for lifting the Girders due to confined space restrictions for tandem crane lift set-up and extra logistics cost of transportation. At first the Precast Girders weighing 426t were loaded using our SBL900 Gantry system on our Goldhofer 19 axle THP/SL multi axle trailer connected to a 680 HP Heavy Duty Prime Mover. The Gantry was set-up using our Liebherr 100t All Terrain Crane and Forklift. The Precast Girders were then lifted and erected on the metro column safely by our 650t crawler crane with SSL2 configuration and 42m main boom. Our team of Engineers, Heavy lift managers and Supervisors were all present on site to ensure a safe and optimum lift with great efficiency. The transportation and lifting activity took place at night in order to avoid busy road traffic and other obstacles. We are proud to contribute to and fulfill Dubai’s mission of connectivity.